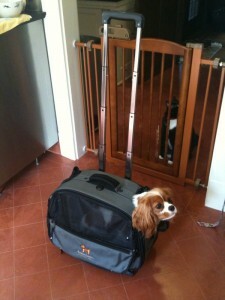 I have long wanted a rolling airplane carrier for Chloe, and I think Creature Leisure’s Pet Pilot XL is the answer. Ours just arrived yesterday, and as usual I’m very happy with how it’s made and designed (I believe that we now own one of every product Creature Leisure offers!). In its normal configuration (9Hx19Lx14W), the carrier exceeds the airlines’ maximum sizes, but it’s just barely workable nevertheless (please note that it lies horizontally in the under-seat space). The 19″ dimension is rigid, so the under-seat space must be at least 19″ wide. The sides and top do flex a bit, so I’m not worried about those dimensions. The carrier has a gusset that can be unzipped to give your dog several more inches of breathing room during flight, if you choose to move the carrier out a bit from under the seat in front of you. The sheepskin pad liner flips down to occupy the newly-expanded space, adding comfort and structural support to the gusset. It has three small but useful external pockets, plenty of mesh ventilation panels (each with a privacy panel, so you can configure things to your dog’s satisfaction), and an internal lanyard that clips to your dog’s collar or harness. There are two straps on the back of the carrier, through which a car’s seatbelt can be fastened. The faux sheepskin liner is, for once in the history of such things, actually thick and soft; when the carrier is lying on its back under an airplane seat, your dog will still be comfortable even though she’s resting on the two uprights of the collapsed handle. Gripes? A couple of the zippers stick — run a finger underneath to keep fabric from interfering with their operation. And the carrier is heavy (10 lbs. ), so you’ll likely be over some airlines’ maximum weights. On the other hand, no one at the airport has ever weighed Chloe or her carrier, so you’ll probably be okay. We finally gave this carrier a workout over the holidays, and I posted my review in February 2010. Hi, sorry I just re-read my post and realized I left out the maker of the bag I am inquiring about…..the pet on wheels carrier is by Tutto. If Brutus can fit into the small Tutto, it would probably be a good choice — I like the Pet Pilot XL better for Chloe, because she needs the two extra inches in length, but life would be a lot easier with a 17″ carrier. Check out the other in-cabin carriers on the site, too, in case another one sounds better to you. And would you let me know which you choose, and what you think of it after your trip? I’d like to know! Hi There! Thanks for getting back to me so quickly! It looks like we are going with the Delta Deluxe (medium) by Sherpa w/ the roll down flaps. I would really like to have gotten the Pet Pilot XL but it was just a little too expensive seeing as we don’t know how often Brutus will be traveling with us. It would have been nice to get a backpack/wheels but brutus is just a little to long for most of them. He just barely fits in the 18″. I found it interesting that when I went to the pet store and tired him in some different carriers that even though some had the same measurements they were similar in size but different enough to make a difference which made me leery of ordering one over the internet (didn’t want to hassle with a return). Our trip is not until December (we got the carrier early so Brutus could get acclimated to it). But I will definitely let you know how it goes, I’m very curious to see myself! Well, we just returned from our trip to Montana and everything went really well! We flew Alaska/Horizon and things couldn’t have gone smoother. The airlines did not ask to see any paperwork nor did they ask to weigh Brutus (and bag). I thought the Delta Deluxe by Sherpa (medium size) worked very well for us and Brutus. The bag fit perfectly under the seats in front of us (as long as it was perpendicular to the seats and the space under both seats were available) and most people didn’t even realize we had Brutus with us. The bag seemed to provide plenty of ventilation and I liked the fact that the top had a zipper opening so that I could reach my hand in and pet Brutus during take off (not his favorite part of the flight). The roll down shades and shoulder strap were also very useful. The only drawback I found with the Delta Deluxe was the absence of wheels (for pulling) or straps (for a back packing). If I had been on this trip alone it would have been very difficult for me to carry Brutus around and I don’t think the bag would have fit under just one seat. Fortunately my husband was with me and did all of the carrying. Also having two seats together ensured we would have room to place Brutus in front of us. I hope this info is helpful, as all of your info was very helpful to me 🙂 Happy New Year! Hi, Kathy! Thanks so much for your report! I’m glad the trip went smoothly — and I hear you loud and clear when you wish for wheels or backpack straps. I’m at the Phoenix airport right now with Chloe, and I’m really, really grateful that her carrier rolls….